Gamma SIP Trunks connect your customers’ businesses with our nationwide network, gives access to the PSTN and provides a more flexible and lower cost alternative to ISDN for inbound and outbound voice calls. First and foremost SIP is significantly less costly than ISDN. It offers your customers the opportunity to make real operational cost savings through free calls to UK 01, 02, 03 numbers, whilst at the same time improving service flexibility. ISDN line rationalisation options and they are the ideal way to reduce the number of PBXs that require maintaining, whilst your customer retains full control of the numbers associated with their business. Gamma SIP Trunks support business relocations by enabling a geographic number to be kept without incurring any ongoing call forwarding costs. This not only ensures continuity of business, it also reduces the cost impact associated with having to change company stationery, directory entries and advertisements. We can also supply SIP trunking with out-of-area geographic number ranges for customers who, for example, wish to appear local even if they don’t have a local physical presence. With Gamma SIP Trunks delivered over Gamma Broadband or Gamma Ethernet, your customers can have a high-quality voice and data service from just one connection and they’ll make significant cost savings. Businesses of all sizes need a business continuity plan for their telephony. Our SIP trunks, when combined with our Inbound service, means your customers’ callers can always get through. Simply divert published numbers to backup locations or mobile phone – instantly and from anywhere. If you’ve ever had to deal with a service outage you’ll know first-hand that speed of response is key. Our active/standby, load sharing and resilience designs are engineered to cope with any situation and maintain your customers’ telephony uptime. Whether your customers need to keep their businesses running in an emergency without the high cost of call forwarding or simply need to balance call loadings between sites during peak, Gamma SIP Trunks will provide a business-grade solution. Our SIP trunking service provides free call termination to UK fixed destinations, including 01, 02 and 03 number ranges, as well as mobile calls, allowing you to focus on the service benefits rather than a straight pricing discussion. If you prefer it, you can set the price your customer pays, creating a uniquely-differentiated proposition, which gives you a massive edge. In addition, SIP provides free internal calls between connected sites, including international. Owning our own national network means we can identify and fix issues faster, through our advanced monitoring and diagnostic tools. 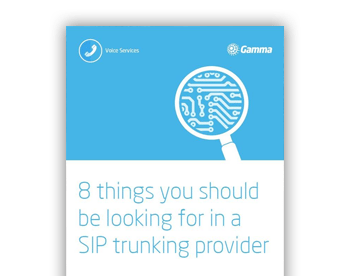 It’s the reliability of our service that’s helped us win many major UK fixed line network awards in recent years and one of the reasons more and more businesses are choosing Gamma SIP Trunks. How does Gamma ensure quality? With Gamma SIP Trunks delivered over Gamma Broadband or Gamma Ethernet, you can have a high-quality voice and data service all over one connection, giving you significant cost savings. SIP Trunk Call Manager provides all the features and benefits of Gamma SIP Trunks together with centralised call control. This includes our market-leading call bundles and the only fraud management tool that protects you and your customers by enabling them to set spend limits. SIP Trunk Call Manager offers a powerful business continuity solution, giving your customers the ability to manage their number estate and all aspects of their inbound calls. Visit our SIP Trunk Call Manager page to find out more. Gamma SIP Trunks are integration-tested and qualified by Microsoft to interoperate with Skype for Business (previously Microsoft® Lync). This enables direct connection of SIP trunks to Skype for Business for external calls from the platform, providing a seamless experience and making it an ideal solution for any organisation that’s looking at implementing Skype for Business or already uses it. We’re a Janet-connected partner with a direct, geographically diverse interconnect to provide Gamma SIP Trunks to the Janet community. Janet is the network dedicated to the needs of research and education in the UK, connecting the UK’s research and education institutions to each other, as well as to the rest of the world.